--EPOTactical.com-- Always outsmarted, never outgunned! : Stuff! How Do I Join the EPO? Joining the EPO is super easy! Just pick your T-shirt size from the menu below and click the "Buy Now" button! 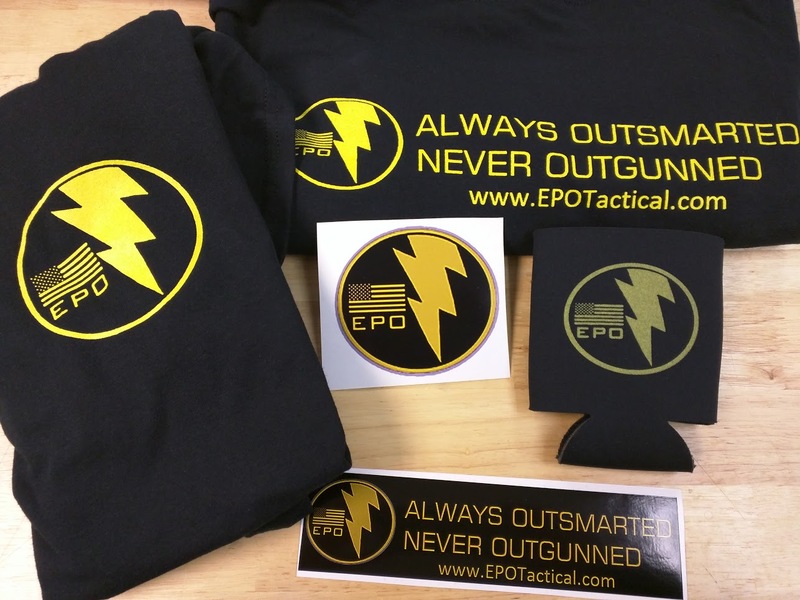 2016 EPO Tactical Swag Pack! Why in the hell would I want to join the EPO again? 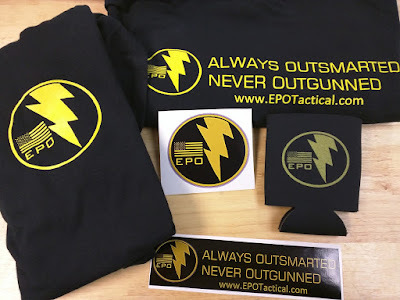 Because once you join, you get your very own EPO Swag Pack! And what's in that again exactly? And a black EPO logo can koozie. Coozie. Cooler. Whatever. Nada. I hate paying shipping on stuff, so when we decided to set this up, I vowed to eat the shipping costs, so shipping is included in the $25. Everything is shipped USPS Priority Mail in a flat-rate box. Shipping times will vary, but will generally be 3-5 days. We're located in Evansville, IN. Can I just order a shirt/ sticker/ koozie/ coozie by itself? So here's the thing- we're just three guys who all have families and full-time jobs. None of us really have time right now to fully support an EPO merchandise operation with multiple options, so we decided instead to offer a package deal in the form of a membership for a reasonable price rather than deal with having to send out all these items individually. It's sorta like an EPO Lootcrate if you will. This allows us to completely control packaging costs, shipping costs, and it's much easier to manage our inventory because we're selling one of everything rather than differing amounts of everything. So right now, no. Unfortunately we can't support you buying just a shirt or just a sticker or whatever. But hey, on most websites a T-shirt of this quality would be at least $20 anyway and you're getting that plus a couple stickers and a can cooler thing!